Client is able to receive e-mail, but not send. If client is unable to both send and receive e-mail, then refer to Accessing e-mail for proper login details. Note, this does not affect webmail. Only desktop/handheld mail clients apply. ISPs commonly implement firewall blocks upstream on port 25 to reduce the amount of spam emitted from its network by compromised computers. 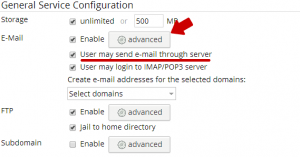 If you are unable to send through port 25, then change your SMTP port to 587 within your respective e-mail client. Certain software, such at Norton Internet Security and AVG may, in certain configurations, restrict communication to the SMTP server. If using such software, refer to its help documentation for further assistance. E-mail client did not enable outgoing e-mail authentication with the mail server. 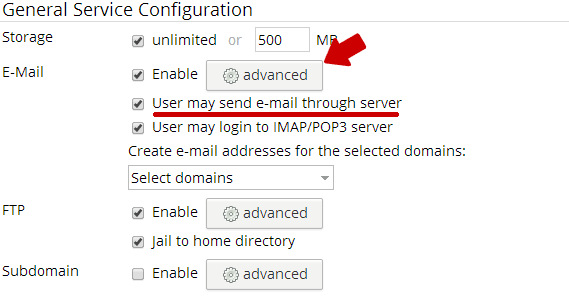 This is absolutely necessary to ensure that only hosting accounts may send mail through the server (and not random machines across the globe). See Accessing e-mail. Verify user can send outgoing e-mail through the control panel under User > Manage Users > Edit action beneath the Actions column. Under General Service Configuration > E-Mail > Advanced, verify that User may send e-mail through server is checked. If checked, verify login information is correct. Lastly, reset password. Confirmation dialog that SMTP is enabled via Manage Users. This entry was posted in Email and tagged e-mail, logging in.